As you'll be finding out soon enough in my September book haul, Kendare Blake's Three Dark Crowns is currently in my hot little hands (well, not currently currently. Because I'm typing this, and that would present some logistical problems..), and I. Am. Excite. Since I can't read it quite yet — gotta finish up Heartless, dontcha know — I thought I'd share with you a few of the reasons I can't wait to dig into this book! 1) 'Tis the Season for dark, atmospheric books. I'm not always a seasonal reader; I have occasional nods to the season in my reading — a beach read here, a wintery book actually read in winter there* — but they tend to be a brief blip in my overall scattershot style of reading. The exception to this is my serious craving for autumnal, atmospheric, vaguely Halloween-appropriate books as soon as cool weather hits. I crave them, and my Fall does not seem complete without them. I already know Blake can do dark. I already know Blake can do atmospheric. Couple that with the synopsis, and this sounds like the perfect Fall read for me! *But let's be honest, that's mostly so I can fully embrace it and cuddle up with a oversized sweater and giant mug of cocoa, and pretend I'm in a scene from some movie with a thoughtful Reader Girl heroine... Don't act like I'm the only one. 2) Kendare Blake is pretty no holds barred. One of my favorite things about her writing is that she is willing to go there, wherever there is. She'll take you to the dark places, and the gory ones, and the ones that just make you damn uncomfortable. Case in point (for me at least): I will probably never be able to get the image of Athena pulling a freaking feather out of the roof of her mouth. Such a simple thing that made me so weirdly uncomfortable and absolutely fascinated... And that's just the tip of the iceberg when it comes to strange and uncomfortable and dark and gory. 3) Kendare Blake is really good at "brutality meets complexity." [So, very slight spoilers a little bit here, but if you haven't already read the fabulous Anna Dressed in Blood, I really don't know what to tell you, but...] Anna rips a freaking guy in half. LITERALLY IN HALF. And you go on to love her anyway, because Anna is kind of amazing. Blake knows how to work the dark and gory — but the reason it works so well, and doesn't just come across as mindless thrills and chills, a throwaway slasher, is because there's some serious substance there. Like, yes, there is the sort of gleeful-splashing-of-blood-on-the-walls element to the stories — there is a level of shock value gore — but it's balanced so perfectly with a real story, characters with depth and humor and general interestingness, that keeps it from ever being a gory schlock-fest. I used to love horror (books, movies, tv shows, didn't matter) as a kid, but I got over it quite some time ago because the development wasn't there; it started to bore me. Horror and gore don't work on more than a surface level if there's not some real connection to the characters; if you don't care, what's the point? With Blake, you end up caring, AND THEN, you end up in a bit of perpetual terror that the characters you care about are going to meet an untimely and very inglorious end — and that is delightful. In a story of three sisters destined to (apparently) attempt to tear each other to shreds, there's bound to be both brutality and complexity. And there you have it! 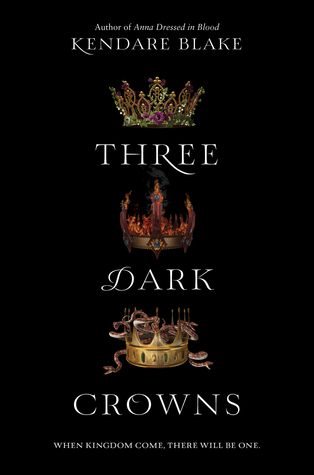 Three of the dark little reasons that Three Dark Crowns is next up on my TBR! If you've read this one or have been wanting to, I'm definitely curious to hear your thoughts in the comments! And I'm planning an October post about some of my fave autumnal, atmospheric reads, so I'd love you to tell me some of yours! "You may be thinking, it’s just a necklace. Doesn’t really seem badass…Well this is actually the most badass necklace ever because not only does it match the cover of the book (more bookstagrams! ), but it is also handmade by an inner city high school student. And the profits from all of the products sold go toward funding that students college education. Pretty badass, am I right? Feel free to check out more of their stuff: The Shine Project." Keep an eye out for more Fall Favorite Things posts throughout these cool, crisp months! Now, see, I haven't read her books, but I like what you say about the brutality having complexity. When I read darker stories, that is what I look for, too. The good new is that this book immediately hooked me - the bad news is I have a while to wait for the sequel. Highly recommend to Blake devotees, as well as fantasy fans looking for something original.